Click here for more pictures of Dos Ojos on a separate page. 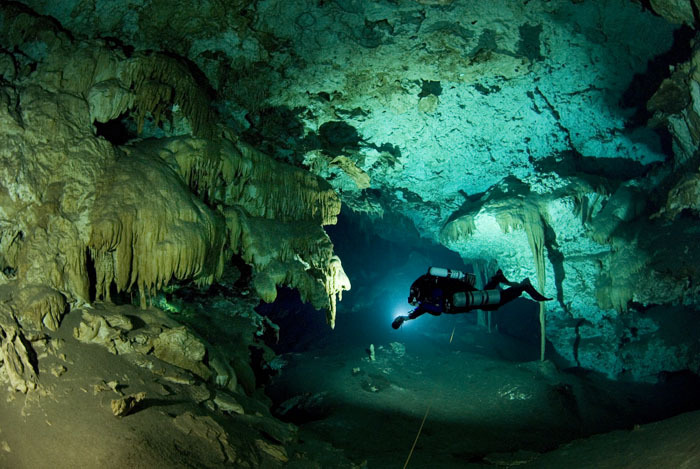 One of my favorite cave dives in Mexico is the downstream dive from cenote Dos Ojos called River Run. 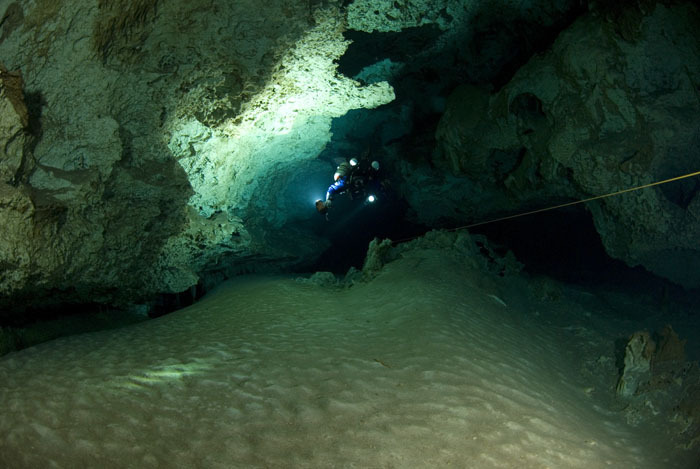 The main line starts well to the side of the cavern line, so one is not competing with hundreds of guided cenote divers. The line then goes straight with no Ts all the way to cenote Dos Palmas and continues on and on, traversing at least couple of other cenotes. The cave around that line is varied and exiting. Smaller passages change into sizeable vertical cracks, some passages are bare, and the others are heavily decorated. 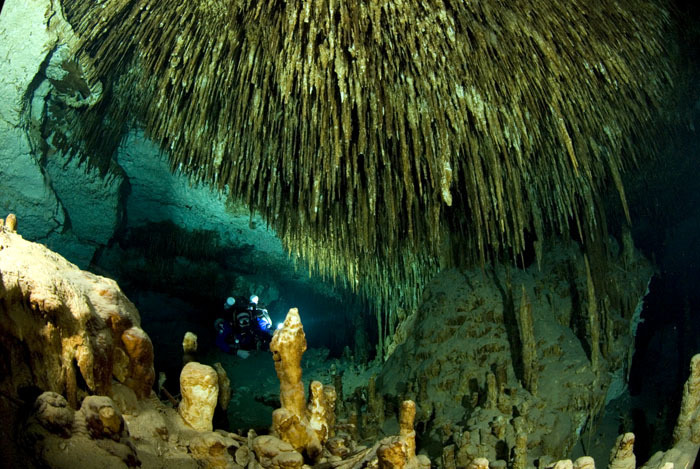 While not even remotely close to Florida-like flow, this is the only recreational cave in Mexico that I have been to so far where one can really notice the flow. 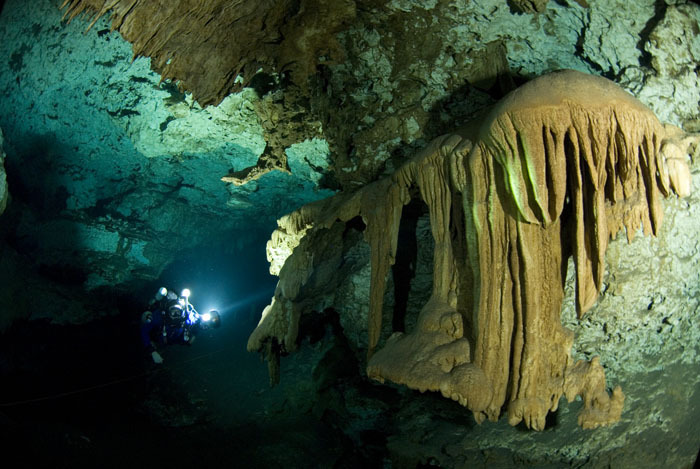 It really feels like you are part of the giant underground river being gently carried towards the sea. Even the floor had the typical wave pattern in places. We tried to swim to Dos Palmas on our second dive of the trip, passed the change of direction markers by a good distance, but had to turn and exit without shooting a single frame due to sensor failure on my buddys KISS. DIL flush confirmed that the other 2 cells behaved and we exited non-eventfully. We returned to do that dive closer to the end of the trip. We were late getting to the cave and the parking lot was so busy we had to park a long way away from the entrance. 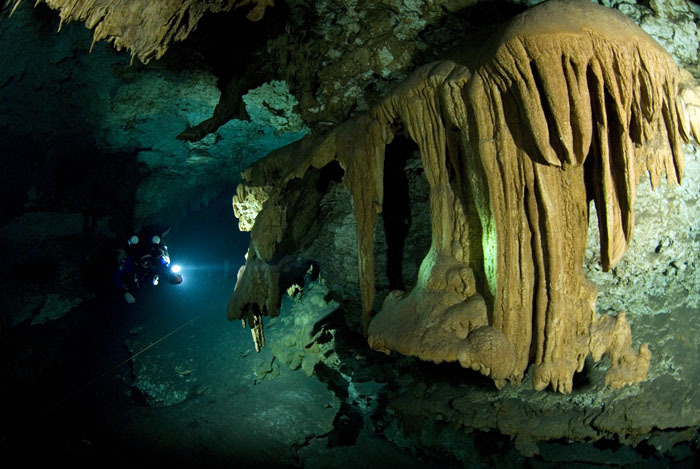 The cavern was teaming with cavern divers and snorkellers  there was a line to get in and out of water. Pre-dive checks done, we went under into the silent world that seemed quieter than ever, compared to mayhem above the water. and going. 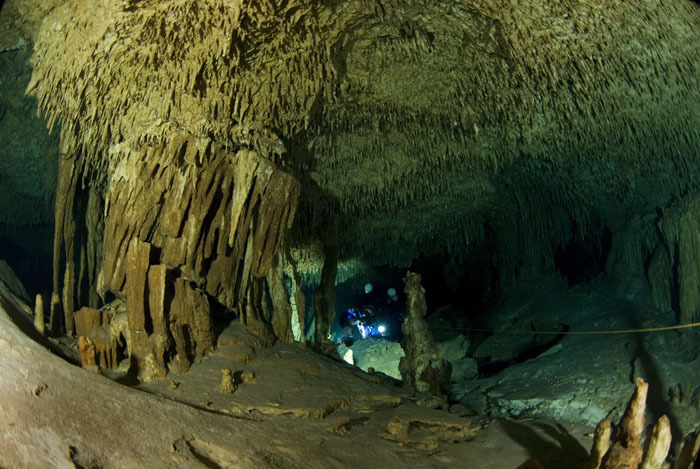 Eventually, we swam though the couple of narrow passages and I felt that we were getting closer to the entrance, so I started putting my hand to my light and looking for the cavern light. My buddy soon caught up to that practice and very shortly, we saw a deem glow of the cavern ahead. The main line came very close to the open water, so we noted where it was and surfaced right above it for a bit of a break. 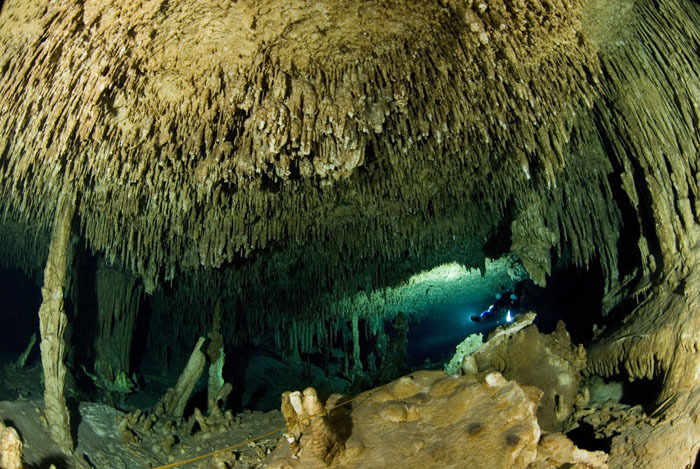 After the mayhem of Dos Ojos, the Dos Palmas cavern was eerily silent as we were the only two people there. We floated and chatted for a while and slowly headed back into the cave. The part of the cave close to Dos Palmas had sections that were incredibly decorated with small sodastraw stalictites on the ceiling and interesting formations on the sides. 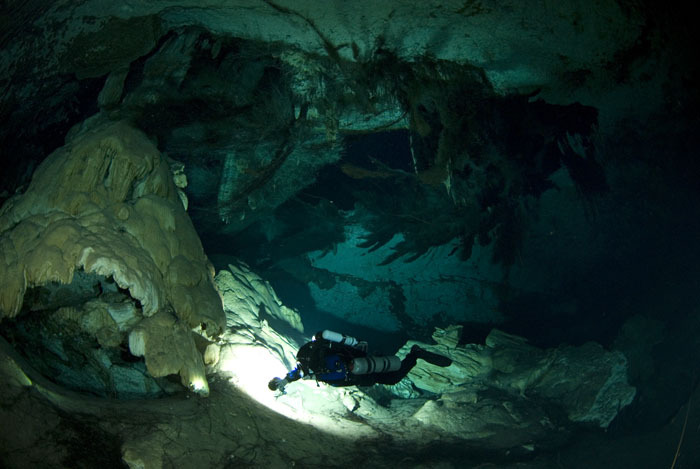 As we neared the open water, I as surprised to find the cavern completely empty, as all cavern tours have left a while ago. In fact we were the last ones on site and it felt nice to have the whole space to ourselves.